You've probably heard of Latisse, the eyelash growing serum that was discovered when glaucoma patients taking prostaglandin analogue eye drops had the desirable side effect of longer, thicker eyelashes. But there's new research showing that not only can prostaglandins make your eyelashes fuller, they can also penetrate the skin and reduce under eye puffiness too. XAF5 is a topical ocular ointment made by Topokine Theraeutics derived from prostaglandins that specifically targets under eye bags. XAF5 breaks down subcuntaneous (under the skin) eyelid fat that causes those pesky puffy under eye bags, or steatoblepharon in the dermatological world. The ointment works by penetrating through the skin and binding to fat cells, shrinking them in size and also preventing new fat cell formation. 90 patients between the ages of 40 and 70 applied XAF5 as a topical cream to their eyelids for ten weeks. 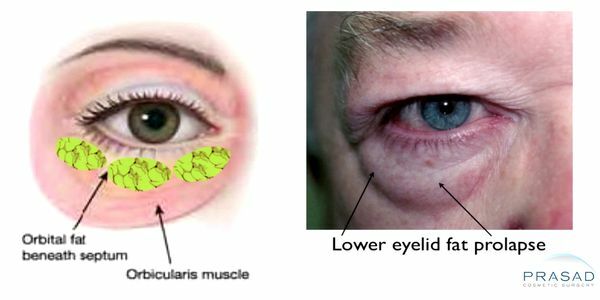 The level of eyelid bags were graded on a 1 to 4 scale (called the Lower Eyelid Steatoblepharon Severity scale). The results: "just under half" of treated patients experienced a 1 point improvement in their eyelid puffiness on the LESS scale after ten weeks of treatment. The patients also reported a change in their appearance: 75% of patients reported improved appearance and 85% said they were satisfied with the treatment. The makers of XAF5 report they are using "a different" prostaglandin than that found in Latisse, one they claim won't cause darkening to the eye or eyelid skin which is a known side effect of Latisse. Another possible side effect of shrinking the fat around our eyelids is creating a sunken globe appearance as the eye settles deeper into the orbital socket. This side effect is sometimes seen with glaucoma patients taking prostaglandins, and is what tipped researchers off initially that the medication could be repurposed for cosmetic use. Researchers report that if a sunken eye appearance does develop, the results will reverse once XAF5 is discontinued. The most common reported side effect with XAF5 application was skin redness, which occurred in 18% of users. Phase 3 clinical trials will be forthcoming. Looking for doctor recommended ways to treat under eye puffiness and dark circles until XAF5 becomes available for prescription? Check out this post for the best at home treatments and products available now. No word yet! In the US theyre saying XAF5 is in “late stage trials” and should be available in the next year or two.